Size: Adult - 1/16" - 5/8"
Identification: Small wasps are black, brown, yellow or red. They are often metalic-like and shiny. Pupae can be seen connected to outside of host insects like caterpillars. Biology/Life Cycle: Adult wasps lay eggs in the bodies of host insects, usually aphids and caterpillars. Larvae are white, wormlike and develop within the host. Several generations a year. Hibernate as larvae or pupae in host insect. Hosts are usually caterpillars or aphids. Silken cocoons in various forms can be seen on the backs of caterpillars. The naked Braconid Wasp species does not form a cocoon. Complete metamorphisis. Habitat: Wherever they can find caterpillar and moth larvae, fly larvae, aphids, codling moths, cabbage white butterfly, and bark beetles. Feeding Habits: Adults feed on nectar and pollen. Larvae eat moth and butterfly larvae. Economic Importance: Control aphids, caterpillar and moth larvae, fly larvae, and aphids. Adults help pollinate flowers. 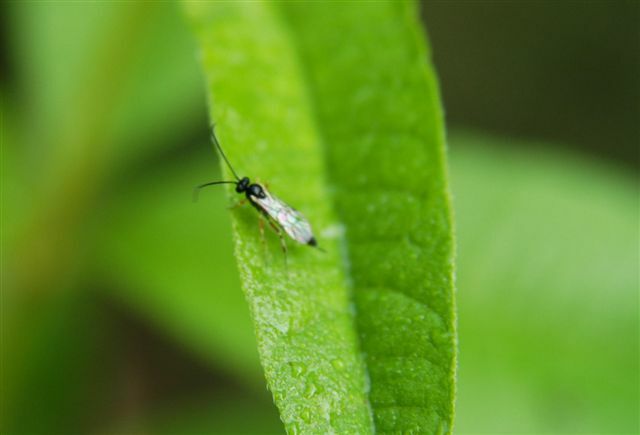 Insight: This little wasp is a classic example of a beneficial insect in that is not widely known but extremely helpful in controlling insect pests. Thousands are killed with every spraying of toxic pesticides. The wasp's pupae stages are greatly varied and interesting. Most have silk cocoons, some just pupate in the hard skin. The silk cocoons vary in appearance. Malcolm photographed one that looks like a cotton ball. We have never seen it recorded in any other book.